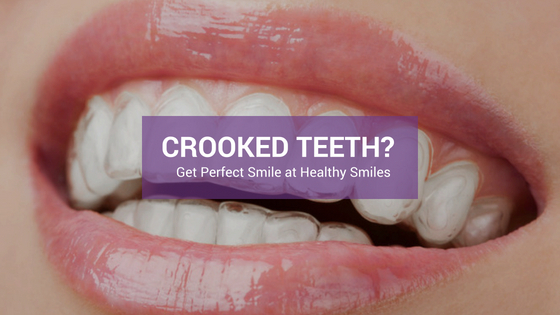 At Healthy Smiles, every patient, no matter what their age can choose from a number of treatments to fix their smile. Among them, the three major treatments we specialize in are, Fixed Orthodontics, Clear Braces and Early Intervention Orthodontics. Fixed orthodontics, traditionally known as Braces are usually preferred by children. They usually involve metal bobs put on the teeth along with arched wires that run around them. Children tend to prefer them because these as aesthetic braces and clear line braces are not an option. Clear braces or Invisalign are usually aligners that are like little retainers that are fitted onto the teeth with the sole purpose of moving the teeth into the right spaces by putting pressure on them from certain directions. Everyone from teenagers to adults prefer Invisalign, as these invisible braces cannot be seen so that they can carry on with their normal lives without having the constant feeling of metal stuck in their teeth. The third option, which not many people know about is known as Early Intervention Orthodontics or Childhood Orthodontics. This dental procedure is usually done on Children from the age of six to twelve, where they are fitted with myobraces, which look like a mouthguard but instead spaces out the jaw to help the development of adult teeth in the subject. We usually discuss this option with parents at the earliest as the negatives of leaving things as it is can either cause the child pain or leave them with crooked teeth for the rest of their life. If a child has a crowded mouth with some adult and some baby teeth, the parents have two options moving forward. They can either decide to not fix this and run the risk of the child having a crowded mouth for his entire life or having an impacted tooth or a deep bite. The other option is learning more about Early Intervention Orthodontics or myobraces. These devices along with the mouthguards and certain exercises of the tongue and the jaw can help shape the development of the jaw of person in a certain way that simply the growth will allow problems such as a crowded mouth are reduced to a minimal extent. Sleep apnea, better known is snoring, is a problem a lot of adults suffer from. Research shows that people who develop late age diabetes or other heart diseases and high blood pressure tend to have sleep apnea or a complete a lack of sleep. These results then gave birth to multiple researches into similar fields and breakthroughs have been made. It has been discovered that one of the main reasons Sleep apnea is the small size of the jaw with the tongue sitting too far back in the jaw. Thinking about it from an orthodontic perspective, a child who visits the dentists at age 13 with a narrow jaw won’t give the dentist many options to correct the crowding of the teeth. The dentist will have to pull some teeth out and rearrange them to clear the mouth. However, this treatment constricts an already narrow jaw which could lead more problems as the child grows. Usually these things are can only be noticed as person ages and sleep, heart and breathing related problems emerge. These problems can be solved at younger age; however, most people simply choose to ignore it. So, if a patient comes to Healthy Smiles with a narrow arch, we can fix it by simply using expanders, that expand the size of the jaw following which we can use myobraces to shape the size of the jaw. This treatment will usually mean that we don’t have to remove any teeth from the patient. Early Intervention Orthodontics: – Suitable for children from the age of 6-12, in this process we use myobraces and expanders so that by the time your child is 12, most of his orthodontic problems have gone. However, for this treatment to work, the children need to be complaint and the parents need to be on-board with the treatments and exercises. Traditional Orthodontics: – Using braces and arch-wires to expand the jaw along with use of expanders. This use of this process could also mean extracting certain teeth from the patient to increase the size of the jaw. Invisalign or Clear Braces: – Invisible braces that help adults carry on with their normal lives. This treatment is usually for late stage adults. Here at Healthy Smiles, we do not believe in the one treatment fits all formula. We ensure that we give the patient all the possible ways in which they could fix their problem. When it comes to younger children, we discuss the current state of the child’s teeth and development of their teeth and jawbones with their parents. With the use of advanced 3D X-rays, we ascertain where a child stands in the developmental stage of his jaw. We believe in letting the patient decide the treatment they are comfortable with but ensure that they make an informed decision by putting forward to them all pathways each treatment would take. So, if you’d like an obligation free consultation, please do not hesitate to ring us at 03 9877 2035 or visit www.healthysmiles.com.au for more information.